Knighton/Tref-y-Clawdd TownKnighton is a market town located in the heart of the Mid Wales Marches. The name Knighton translates as Tref-y-Clawdd, which means Town on the Dyke and refers to the fact the Knighton is the only town to be built on Offa's Dyke. Knighton is rich in history with half-timbered houses, winding streets known locally as "The Narrows". There is evidence of settlement in the area dating back to the Stone Age but the current town is mostly medieval in origin. The area around Knighton in Powys is perfect walking country. Knighton is unique in Wales in that two National Trails meet - Offa's Dyke Path and Glyndwr's Way. The accolade of two National Trails is just a small indication of the profusion of walking opportunities in the area. Offa's Dyke was built toward the end of the 8th Century by King Offa to separate the kingdoms of Mercia from Wales. It ran for 149 miles from Chepstow to Prestatyn and some 80 miles of The Dyke is still traceable today. Whether you want to potter along gentle paths and country lanes, nordic walk or strike out through the high country on Glyndwr's Way you will find what you want here. It's a great place from which to start - or finish an expedition along the Offas Dyke Path or Glyndwr's Way National Trails and a visit to the Offa's Dyke Visitor Centre on West Street is a must. For leisure cyclists, Knighton provides access to some of the loveliest day cycling in Wales. Information packs are available from Offa's Dyke Centre featuring easy-to-follow maps and written route instructions. Circular rides range from 9 to 33 miles (15 to 55km) in length. Other Knighton attractions include the Spaceguard Centre, an independent observatory which monitors the potential threat to our planet posed by 'near earth objects'. Events include a regular Farmers Market and the Knighton Show and Carnival held in August. Knighton has a railway station on the Heart of Wales line that runs from Shrewsbury to Swansea. 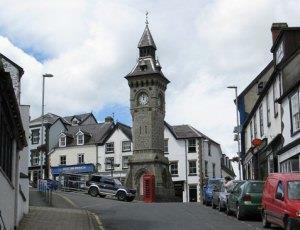 Knighton is a market town located in the heart of the Mid Wales Marches. The name Knighton translates as Tref-y-Clawdd, which means Town on the Dyke and refers to the fact the Knighton is the only town to be built on Offa's Dyke. Knighton is on the Heart of Wales railway line with 4/5 services a day in each direction Mondays to Saturdays and 2 on Sundays. There is also additional local public transport in and around the area.